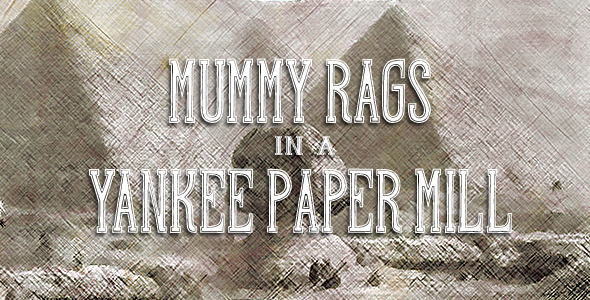 Although the story of the existence of mummy paper in the mid 19th century was never conclusively proven to be true, it was widely reported in various major newspapers as well as the trade publications at the time. Here is one of the articles written on the subject of mummy paper, published in The Printer - November 1858. A correspondent of the New York Journal of Commerce, writing from Gardiner, ME, says: “Yesterday I visited, in the company of Mayor Woods of Gardiner, the two principal paper factories, and I was astonished in looking at the millions of pounds of rags piled up in warehouses or spread over acres of ground, to find that a portion of them had recently arrived from Alexandria, in Egypt. They were the most disagreeable, odoriferous old clothes that I have ever had the fortune to smell. This doubtless was owing to the fact that a part of them were in a damaged state. The Egyptian rags had been collected from all corners of the Pacha’s dominions – from the living and the dead. How many cast-off garments of Howadjis and Hadiis; how many tuns of big, loose, Turkish ragged breeches, and how many headpieces, in the shape of old doffed turbans, the deponent saith not. But, the most singular and cleanest division of the whole filthy mass were the plundered wrappings of men, bulls, crocodiles and cats, torn from the respectable defunct members of the same. 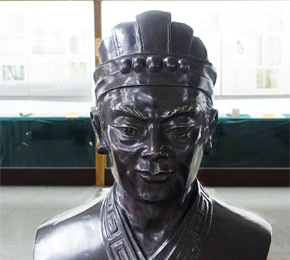 In 105 AD, Cai Lun invented paper making process. 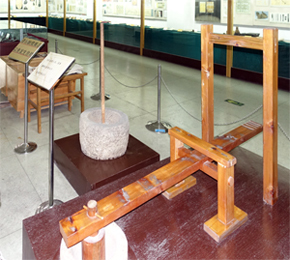 His bust is prominently displayed at the China Printing Museum, in Beijing, along side the replica of his paper making apparatus. Not until another 500 years later, the invention finally reached Korea and Japan, and soon after Tibet, India, the Middle East, Spain and Italy. The technology continued to be improved and refined as it spread further to Europe in the 1400's. Innovations were introduced to the manufacturing processes as well as improvements to the quality of the paper. Paper mills were sprouting up all around Germany and the rest of Europe. In the 17th century, the Dutch invented a new way to make pulp, putting them at the forefront of the papermaking technology. By the 18th and 19th centuries, papermaking was a growing business sector as the demand for paper continued to increase fueled by the advancements in the printing machinery and processes. Charles Fenerty, a Canadian from Lower Sacksville, Nova Scotia, and Friedrich Gottlob Keller, of Germany, independently and unaware of each other's activities, experimented and discovered papermaking process using ground wood pulp in 1844. Fenerty never registered any patents of his invention, while Keller did. This was the beginning of the full scale industrialization of papermaking.